Despite poor weather, we had people come from Southern Washington and as far north as Vancouver Canada. Throughout the day there were between 30 and 70 people. Vehicles included a bunch of Model S sedans (including a P85D! ), some electric bicycles, Nissan LEAFs, a Chevy Volt, a converted BMW Z3, a converted Honda Del Sol, an electric Fiero and Dave Cloud's latest super low-slung creation. Of the approximately 20 EVs in attendance about a dozen of them raced the track. Highlights included massive tire smoking burnouts from a 2011 and 2013 Nissan LEAF and an 11.8 second pass from the Tesla P85D! 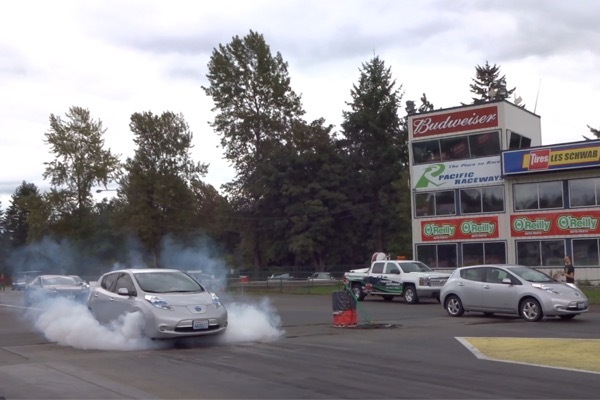 Ryan Fulcher burns rubber instead of oil as he lights up the tires on his stock 2011 Nissan LEAF before racing against Ron Easley in his 2013 Nissan LEAF at Pacific Raceways in Kent, WA. Teslas and various other electric vehicles can be seen waiting in the staging lanes in the background. Event is open to all 100% electric vehicles and will be an exciting combination of road racing in the morning with a professional race driver leading on the 2 1/2 mile road course, and then continuous drag racing in the afternoon on the 1/4 mile drag strip. Competing vehicles will include high-performance conversion EVs, purpose-built racing machines, and factory produced EVs including Tesla, Nissan, BMW, Mitsubishi and others. This is one of many events planned on Sept. 20 as a part of Plug-in America's National Drive Electric Week. When drag racing finishes at 3pm racers will caravan over to the historic Triple X Rootbeer in Issaquah for burgers, shakes and socializing. $50 for 1/2 hour sessions on the 2 1/2 mile course. Instruction from professional drivers. $40 - Test and Tune. Make as many runs as you like down the drag strip. Open to all types of vehicles, here's an opportunity to skip the usual long staging lines, the stench of race fuel and loud gas cars and drag race your electric vehicle as much as you want! Go head-to-head with your 100% electric friends and see who's the quickest! PLUS!- Discount for combination road racing and drag racing competitors which is $15+$50+$30 so total - $95 for racing both events. All vehicles and drivers must pass safety/tech inspection. Bring a bike, motorcycle, car, dragster or just about anything as long as it's 100% electric. Please wear long pants and sensible shoes (no open toes or sandals) and make sure your vehicle is in safe operating condition. Come early to speed through safety/tech inspection and maximize your racing time! Drivers of motorcycles and bikes must wear helmets and leather jackets. Helmets are recommended for all racers and required for convertibles and any EV quicker than 14.5 seconds in the 1/4 mile. Get ready to burn rubber without burning oil and we'll see you bright and early Sunday Sept. 20th, 2015 at Pacific Raceways! Pacific Raceways is Washington's premier racing facility and NHRA sanctioned 1/4 mile drag strip first opened in 1959. The management at Pacific Raceways sees electric vehicles as an integral key to the future of racing and is boldly taking this on as an all-electric event! The National Electric Drag Racing Association (NEDRA) exists to increase public awareness of electric vehicle (EV) performance and to encourage through competition, advances in electric vehicle technology. NEDRA achieves this by organizing and sanctioning safe and exciting electric vehicle drag racing events. Registered attendees report 5,380 electric miles driven.